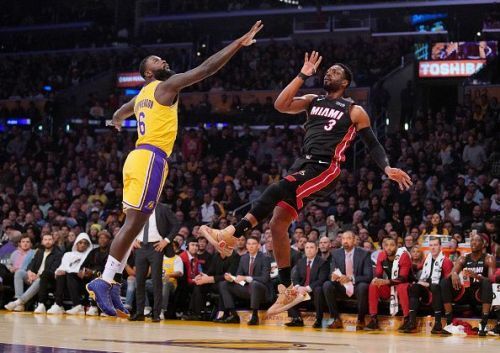 The Los Angeles Lakers came away with a tight 108-105 victory over the Miami Heat in what will certainly be Dwyane Wade's last encounter at the Staples Center. Wade added 15 points and 10 assists off the bench for the Heat side that won the last encounter here against the Clippers. 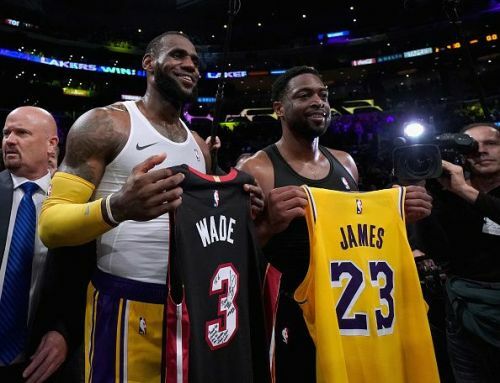 After the match, Wade and James exchanged jerseys and James also edged ahead in head to head matches against Dwyane Wade 16-15. The Lakers looked lethargic for most of the match, not playing with the pace and energy which helped them blow away the Grizzlies. But they improved once the match started getting towards the endpoint. For the most part of the first three quarters, it seemed as if the Lakers lacked effort both on the offensive and the defensive side. LeBron James was surveying the court and looking to find open teammates and not driving and scoring points for himself. Lonzo was missing most of his shots and even passed some open shots. The Heat were better on the glass. They were rebounding and getting second-chance points. The Lakers struggled continued mightily from the Free Throw Line. They shot just 12-20 from the FT line. LeBron was 2-6 from the line before he shot the two clutch free throws. The Lakers need to improve on their free throw shooting if they want to compete with the Warriors in the West.